This cauliflower risotto is quick enough for a light weeknight dinner because riced cauliflower cooks 3 minutes vs. rice that takes 40 minutes. 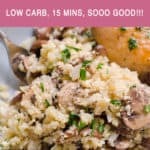 Not to mention the low carb-ness of cauliflower rice risotto, the dreaded carbs! Truth is we need carbs, complex carbs, not simple white bread and pasta carbs, just not as much as we eat them here in North America. And another issue is that we do not move enough to burn off those carbs. Again, thanks comfortable life in North America! So, that’s how we got to reality of making risotto with cauliflower instead of rice in 2018. And that’s OK because I like it! 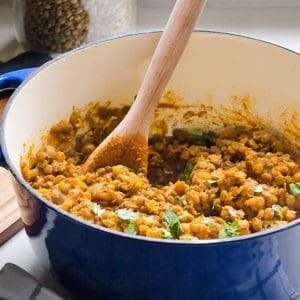 It is so flavorful and hearty – just read the reviews! 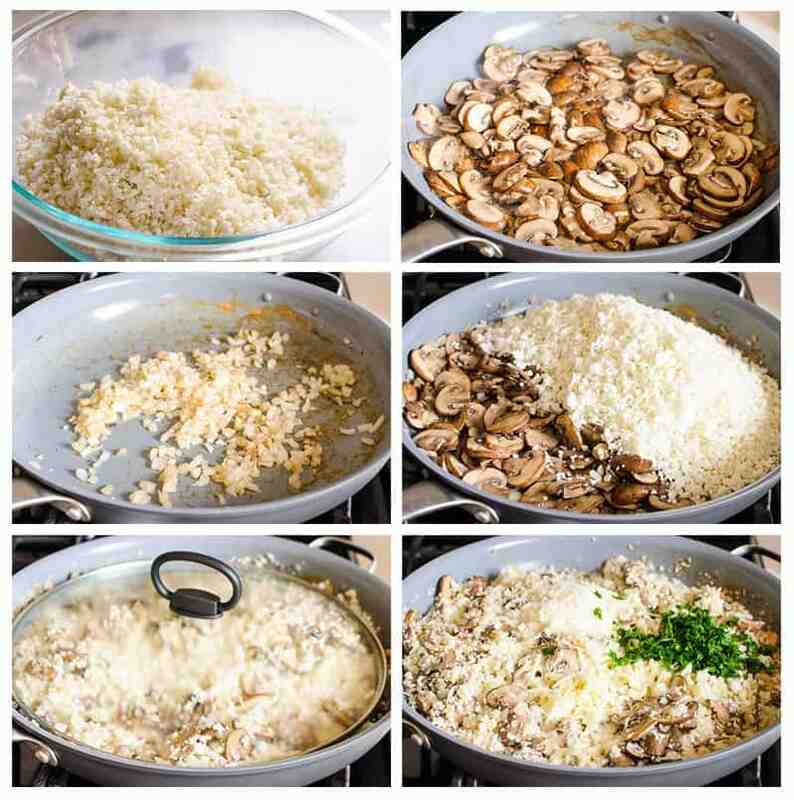 There are golden brown mushrooms sauteed with garlic and onion, then sprinkled with cheese and parsley. You do need a food processor to make “rice” from a cauliflower, or you can buy pre-made cauliflower rice at Trader Joe’s, Walmart, Costco etc. 1 bag of “rice” replaces a medium head of cauliflower. I usually go the 1st route because Canadian stores either do not sell cauliflower rice cheap or most don’t carry it. Yup, welcome to Canada! We get all cool things last, I swear. In a food processor, add cauliflower florets in 3-4 batches and process until “rice” forms. The key to proper coarse “rice” texture is not to overcrowd the bowl of food processor. Or use a bag of store bought cauliflower rice. Cook brown mushrooms until golden on high heat. Now it’s time to add flavor with onion and garlic. Just saute them. Combine all ingredients with broth, salt and pepper. 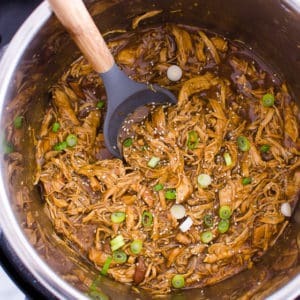 Stir, cover and cook for 4 minutes. Turn off heat, add Parmesan and mozzarella cheese and parsley; stir until cheese is melted. Serve warm. What to Serve Cauliflower Risotto With? 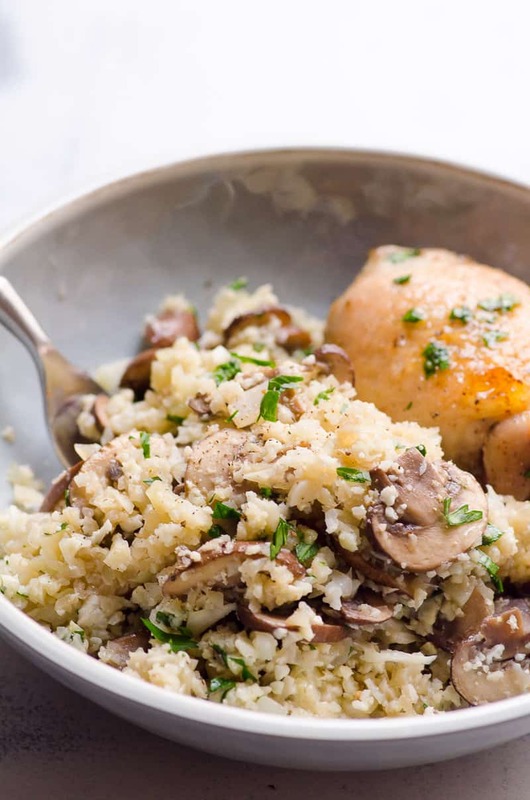 I would serve cauliflower mushroom risotto with baked chicken breast, super easy Instant Pot chicken breast or killer baked chicken thighs. And that’s exactly what I did. Doesn’t it look amazing? Who needs to go out?! True date night at home healthy dinner! The kind of night me and Alex are about 2 years overdue because apparently older kids don’t go to bed as early as they used to, especially in summer. But come fall-winter, in our new house, I promised myself! 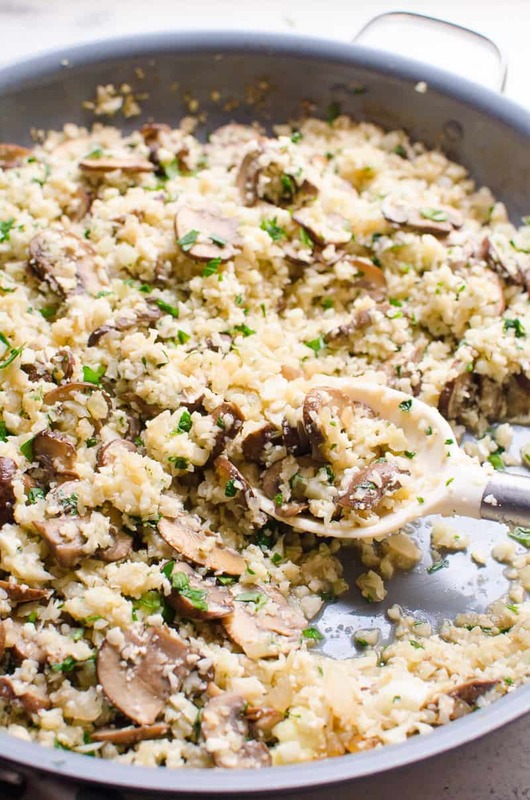 Cauliflower fried rice that will blow your family’s mind! Thai cauliflower rice that is saucy, flavorful and so tasty! 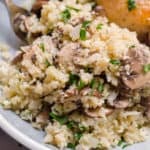 Easy Cauliflower Risotto Recipe with brown mushrooms and cauliflower rice sautéed in flavourful broth all in 15 minutes. 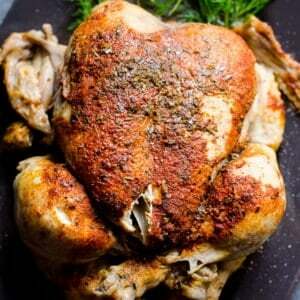 Hearty and healthy low carb dinner with amazing reviews. 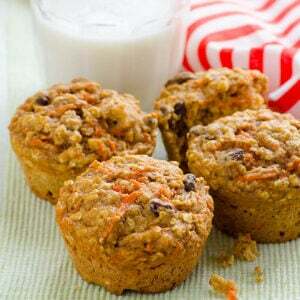 In a food processor, add cauliflower florets in 3-4 batches and process until “rice” forms. The key to proper coarse rice texture is not to overcrowd the bowl of food processor. Transfer to a medium bowl and set aside. 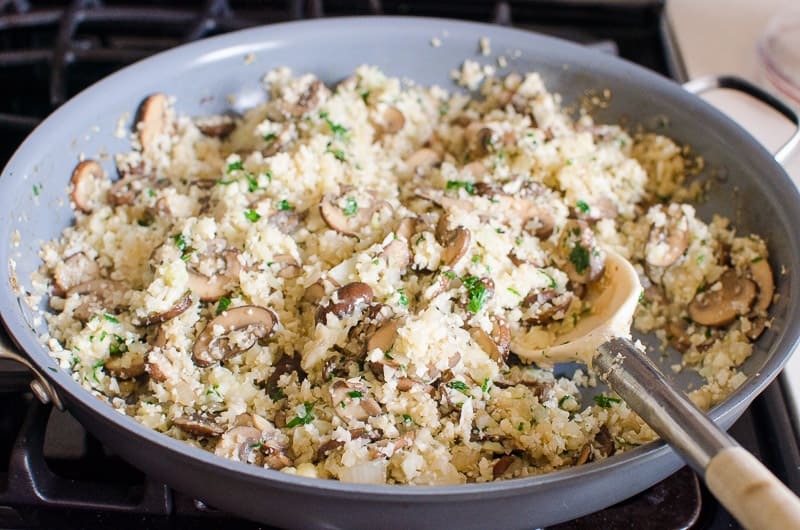 Preheat large non-stick skillet on medium – high heat and add mushrooms. Cook until golden brown or about 5 minutes, stirring occasionally. Transfer to a medium bowl and set aside. Return skillet to medium heat and swirl oil to coat. Add onion and garlic, sauté until translucent or about 3 minutes, stirring occasionally. Add cooked mushrooms, cauliflower “rice”, broth, salt and pepper. Stir, cover and cook for 4 minutes. 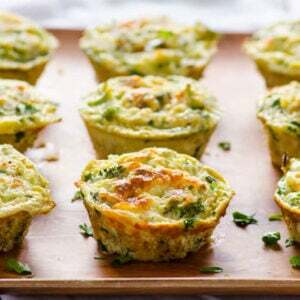 Turn off heat, add Parmesan and mozzarella cheese and parsley; stir until cheese is melted. 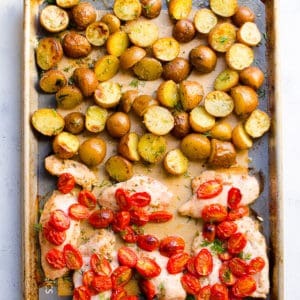 Serve warm with chicken of choice (I like almond crusted chicken). 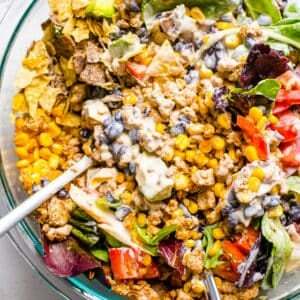 Store: Keep refrigerated in a glass airtight container for up to 2 days. *Or use a bag of store bought cauliflower rice. If using frozen, don’t thaw and add a few minutes to cooking time. **Sub half of the stock with white wine if you wish. Made it tonight! The family devoured it! So Easy!! 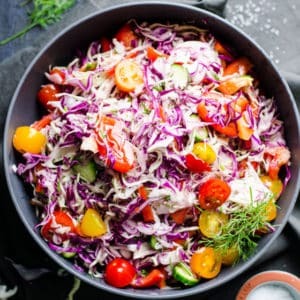 This is delightful without the cheese for those of us who are lactose intolerant and so quick with ready to use riced cauliflower. Love! I didn’t have high hopes for cauliflower risotto but this came out super good! OMGosh Olena, this was amazing! I consider myself a seasoned cook at 65. I was googling rice cauliflower recipes and yours popped up. I love Risotto, but only made it once with fish, and it was delish! I try to stay away from most carbs as my family is ridden with type 2 diabetis. I decided to try your recipe tonight for dinner, and it wowed me. Of course we always tweak a recipe to our own taste buds, and I did do half white wine with half broth for the liquid. I also did cook it on low longer until our meat was cooked. This will be my new go to recipe for cauliflower from now on. Thank you! Great fun! I added some dried wild mushrooms(chanterelles, porcini, etc) to the broth to intensify the flavor and was great. Veggie broth is good, but not as savory as the chicken. Great job! 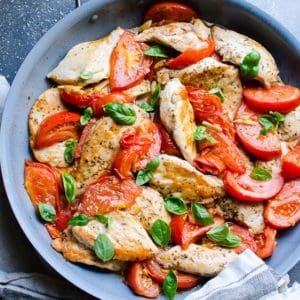 This is a great recipe, i loved it. I added some chorizo and it was absolutely fab. Glad to hear Liz you are enjoying the blog. Good for you, life is too short to be unhealthy or torture yourself with a diet. Yay for low carb risotto! 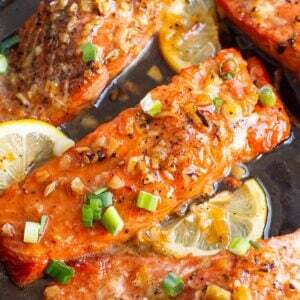 Going to try this with frozen cauliflower rice and toasted almonds. Thanks for the recipe! 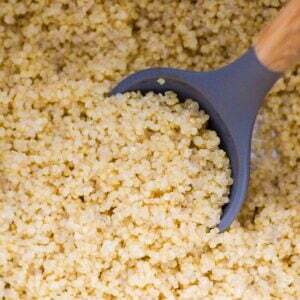 Hello, If using frozen cauliflower rice, would you just heat it up in skllet first to dethaw or what steps did you take with the frozen rice? Just add a few minutes to cooking time. Made this last night and loved it! I skipped the mozzarella and did half the parm, and it was still amazing! My mother, child and husband all loved it too (and my husband is typically veggie adverse). Keep up the yummy posts, and ignore all of the strange people who spend time nit-picking about such trivial things in your recipe instructions! Glad you enjoyed it, Susan. 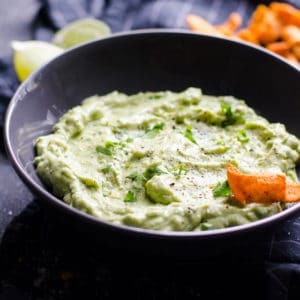 I can’t believe how much attention this recipe is getting. Considering, I’m not vegan or vegetarian, I could care less. So true. I will officially ignore any comments about the cheese from now on LOL. Again, glad the youngest and the oldest liked this cauliflower risotto. Those are the hardest to please, sometimes older ones are even pickier than kids haha. Made this tonight with some changes, because I can’t leave a recipe alone, lol. Substituted shallots for onions, and added precooked quinoa at the end. Also cut recipe in half since there are just two of us. Left overs are going in veggie stock for lunch tomorrow. Great recipe, was delicious. Thanks. Um, yes. I noticed I am modifying even my own recipes which makes me laugh every time. So, I get it. Glad you liked. Thank you for this – I really enjoyed it, a very risotto-y rice cheat. Yep. You are welcome, Erin. Wow, Natalie. I would never think to take it to the office party. I’m so happy you did and it worked out for you! 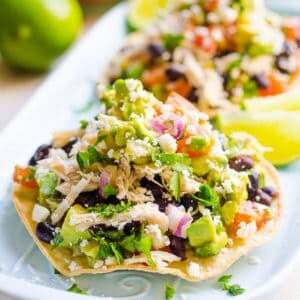 Honestly, I’m so hesitant to share many my recipes with big crowd gatherings because many people just don’t get it and their tastebuds are so clogged up by sodium and sugar. You are brave! My husband tells me what people eat in his office and I get goosebumps and they all laugh at him but deep inside are jealous, I’m sure LOL.